Studies of primate skeletal remains from the Eocene epoch of North America and Europe have brought to light several derived features of the autopod that distinguish primates from their close relatives: the plesiadapiforms, der-mopterans, and tree shrews. This discussion of derived autopod features is restricted to the digital rays and does not include a discussion of the carpus and tarsus, as the morphology of these bones in early primates has been dealt with elsewhere (e.g., Dagosto, 1988; Gebo, 1985; Godinot and Beard, 1991; Hamrick, 1996; Hamrick, 1999a). Dagosto (1988) figured a number of terminal phalanges representing the Early Tertiary primate family Omomyidae that showed these early primates had short, broad, nail-bearing digit tips. In contrast, plesiadapiforms, such as Plesiadapis insignis (Gingerich, 1976) and Phenacolemur simonsi (Beard, 1990) resemble tree shrews and der-mopterans in having narrow, compressed, claws. Godinot (1992), however, noted that the terminal phalanges of the adapiforms Smilodectes and Adapis were somewhat keeled in dorsal view and not as spatulate as those of omomyids. This led Godinot (1992) to suggest that these primates may have had claw-like tegulae rather than broad, flat ungulae. The structure of mammalian distal limb integumentary appendages (e.g., ungulae, falculae, tegulae) varies in part according to length of the terminal phalanx (Hamrick, 1999b). Growth rate of the nail or claw is correlated with terminal phalanx size, such that the nail on the third (longest) finger of humans grows at a faster rate than the nail on the fifth (shortest) finger; and human fingernails grow up to four times faster than toenails (Williams, 1995). Furthermore, the number of claw layers is proportional to the proximodistal length of the germinal matrix, which is in turn proportional to the length of the terminal phalanx (Hamrick, 1999b). Increased terminal phalanx length relative to body size is, among primates and tree shrews, associated with an increase in claw thickness and number of claw layers (Hamrick, 1999b, 2001b). Comparison of digit proportions among early primates, plesiadapi-forms, primitive mammals, such as Megazostrodon and Ptilodus (Table 1), and modern archontan taxa (Table 2), shows that primates (including adapiforms) have relatively short-terminal phalanges (Figure 4). Thus, reduction in terminal phalanx length associated with claw reduction does appear to be a primitive feature for euprimates likely related to habitual foraging on slender arboreal supports (Cartmill, 1974; Hamrick, 1998, 1999b). Furthermore, it is clear that the various orders of archontan mammals differ considerably from one another in terminal phalanx morphology and proportions (Figure 5), indicating that diversification of autopod morphology was key to the radiation of arboreal behaviors in these mammals. *Abbreviations: BMNH = British Museum of Natural History; UA = University of Alberta; PU = Princeton University; MNHN = Musée National d'Histoire Naturelle; UMMP = University of Michigan Museum of Paleontology; SMNK = Staatliches Museum für Naturkunde Karlsruhe; SMF = Senckenberg Museum Frankfurt; AMNH = American Museum of Natural History. Figure 4. Ternary plot of relative pedal digit segment lengths in living and fossil mammals. Sample sizes are shown in Tables 1 and 2. Length of proximal phalanx, intermediate phalanx, and distal phalanx from the third toe is divided by the total length of the three segments added together multiplied by 100. The ellipses enclose the range of individual values for each group. Figure 5. 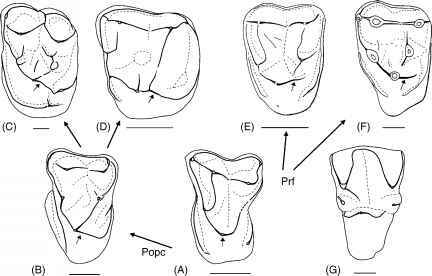 Lateral views of the third toe in a fruit bat (Pteropus), colugo (Cynocephalus), primate (Otolemur), and tree shrew (Tupaia) illustrating the relatively long proximal phalanx and reduced terminal phalanx of primates. Not to scale. the branch in a firm grasp. Primates resemble bats, dermopterans, and Plesiadapis in having relatively long toes (Figure 6) and fingers (Hamrick, 2001); however, these mammals have increased the relative length of their fingers and toes in different ways. 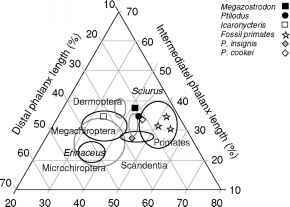 Dermopterans and bats share relatively long intermediate phalanges, whereas primates and tree shrews have proximal phalanges that are longer than their intermediate phalanges (Figures 4, 5; Hamrick, 2001c; Hamrick et al., 1999). Furthermore, as noted in an earlier section, dermopterans and bats have long, hook-like claws, whereas primates have reduced the length of their claws and terminal phalanges. Thus, primates are derived among these archontan mammals not in having long digits per se, but in having digits that are long due to elongation of the proximal phalanges. It should be noted that this is not true of anthropoids, which have relatively long metatarsals (Dagosto, 1990). The condition shared by adapids, tarsiers, and strepsirhines is inferred to be primitive for euprimates with the anthropoid condition considered a reversal resulting from a shift to more frequent positional behaviors on large-diameter, horizontal supports (Gebo, 1986). Figure 6. Univariate plot of estimated digit length (proximal phalanx length plus intermediate phalanx length) relative to metatarsal length in several living and fossil mammals. Data are from the third toe and sample sizes are shown in Tables 1 and 2. Data for Plesiadapis are from P. cookei because complete third metatarsal length is not preserved in the specimen of P. insignis. terminal phalanx indicating that the hallux probably bore a flat nail instead of a claw. These findings suggest that the derived morphology of euprimates may have evolved in a mosaic fashion, with elongate digits appearing prior to the origin of flat nails. These discoveries also demonstrate that the Early Tertiary diversification of angiosperms was accompanied by a corresponding diversification of autopod proportions in small-bodied, arboreal mammals. The evidence discussed in an earlier section pertaining to evolvability in the mammalian autopod provides a mechanistic basis for these patterns observed in the fossil record.